When trying to grow business in your jurisdiction, how do you balance an international English speaking audience with locals? Gavin: G'day folks and welcome to another episode of Government to Business. My name's Gavin Atkinson and today I have a really interesting interview with two gentlemen who help look after the Dutch portal for business. So that's Business.gov.nl which is an English-language portal and the Dutch equivalent, which is a little bit more mature called Ondernemersplein.nl. And their names are Wouter Nieuwenhuis and Laurens den Ouden. So both Wouter and Laurens have a lot of experience with what they're doing currently within the Dutch Government. We really go into a lot of interesting, interesting areas. We discuss how building momentum with the "founding fathers" behind the projects, you know, the actual champion agencies, was able to kind of build examples of success and then help overcome internal obstacles within government. We also look at how other EU governments can actually learn from the Dutch experience, particularly around segmenting the business audience from both an inside and outside the country perspective. And what that correspondingly delivers and how that varies between the two. And we also look at I suppose the importance of having a regular high speed agile improvement and development to your government portal. It's a really intriguing interview and I hope you get as much out of it as I did. 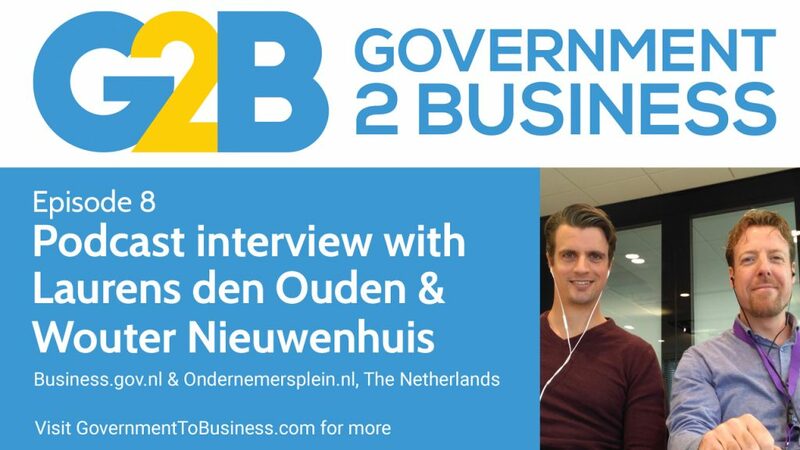 In the meantime sit back relax, and enjoy our interview with Wouter and Laurens on the Dutch experience with delivering government to business services in the Netherlands. Gavin: Welcome Wouter and Laurens to the Government to Business podcast. Thank you so much for joining me today. I came across the Business.gov.nl and it's Dutch language counterpart Ondernemersplein.nl recently when I was reviewing how governments in the EU were actually approaching the the changes that were occurring to privacy regulations with GDPR. And I found at the time I was really impressed with a few things. One, the fact that you were actually very prominently and significantly putting this major regulatory change impacting on business smack-bang there on the home page. It was very, very obvious. And then you actually went into that information it was presented in a highly customer focused way. It wasn't in the usual government jargon. It was actually quite consumable information and very practical information. So great job there. I did a little bit of digging further and found that the more I looked at this particular site the more it really resonated I guess with that whole view of having a single one-stop shop, or a one answer from government I think is the translation within the English version site. Can you tell me a little bit around the Netherlands Government's approach toward creating this one-stop shop of business? Wouter: Well first of all, thanks for having us Gavin and the approach I think, it was realized and we're talking about about six years ago from now when this project started. A very fragmented landscape was there for entrepreneurs where to get information to get things done they had to visit multiple sites, contact multiple agencies and spend a lot of unnecessary time actually that way. So the goal was to create a much less bothersome government for entrepreneurs so they could actually spend more time on what they should be doing, running their business. to put a focus on one answer for entrepreneurs and that's what we started creating from that point on. Gavin: So what was the actual impetus? What started that whole process? What was the strategic driver behind that decision? Why did the Dutch government say "Yes, we're actually going to bring all this stuff together"? Wouter: Well, this was, I have to admit before my time here with the project. I know the minister Henk Kamp, Minister of Economic Affairs at the time was responsible and was very entrepreneur oriented in his approach and made the directive, the law, to start that, the actual strategic reasoning behind the start documents would have to be a question for the ministry itself as we are actually given the assignment and we are in the executive role here where we put it into work. But for us it's quite simple to actually defragment this, to bring different organizations together if they have overlap to make sure that there's no information the same on competing websites, different styles for the same story. It's a challenge but the main focus, the reasoning behind it was let's stop entrepreneurs wasting their time on opening 10 different tabs in their web browser to try and find what information they need and just bring it together in as little information and as clear information as possible. Gavin: So in doing that, was that something that from a cultural perspective, was it something top-down coming from, the ministerial-level saying, "Look this is what we want to try to achieve and these government agencies will be involved." Or was it more a combination of that and a little bit of bottom up with that whole premise around the customer experience and how can we make it easier across government? Laurens: Yeah, I would say, Laurens here, I would say as particularly from the English website. I would say Business.gov.nl has got the same assignments more or less the same as the Dutch website and, but also, the Dutch model is a lot of bottom up. So just look where are the, look from the point of view of the entrepreneur and from their own start and make things that work and then get all agencies together to join us. So it's, I would say it's the cultural change is not only think from your own agency. But think from the bigger picture for the entrepreneur. But that's a continued struggle, continuous challenge and Yeah, I think we're getting, we're on the right way. But it's constant. Yeah make good combinations and also be proactive as a organization, as a website, and try to give the bigger picture also to the other agencies. Gavin: So you both talked a lot there around the nature of the entrepreneur and trying to meet their needs. What were the, I suppose what were the activities, what was the approach? And you may not have been there at the time, but you probably know the backstory around, look, how did you identify those problems? What were the main issues to be able to bring this all together? Wouter: Well the Dutch project has run a lot longer than the Business.gov.nl initiative that we have had since the end of August (2017) so from there we have continued the experience we gathered on the Dutch portal. Wouter: It's the same team. So for us, it's more like a new sibling, a new sister project within the same development team within the same core team. So the proposition is pretty much the same. But the target audience has some differences. As in the English language group is a slightly different audience, but our approach is very similar and well to focus on the end customer, the entrepreneur, I think because we've done it for so many years it's grown pretty natural to us, that sometimes we forget that this is the aspect within the government that gives us quite a unique edge. So government organisations, our partners and stakeholders, especially in the earlier days, really had to transform to get to that user-centric approach and have more trouble perhaps breaking free from different government's directive and for us we we were mostly a hub of different content delivered by senders outside, so we could focus on combining that, optimizing that, distributing that in a optimal way. And with doing so, we could see how do we do the testing of our designs, experimenting with different content types, different combinations, doing a survey, doing testing on users, beginning very much to get to know the audience in this way. And for English we continue with that, for example what Laurens is doing right now. Laurens: And its also important to have a very open approach to the stakeholders and to focus on strengthening each other instead of - fighting each other - if you know what I mean. So I think that's a very important cultural change that is still happening and still growing and we we want to be connected also in the European system with the other point of single contacts to show the people and agencies that this could be a big step forward in lowering the boundaries also for entrepreneurs who want to go to another member state. Gavin: So, one thing, I've had experience across a number of different governments now where they've really dealt with that challenge. Initially, it's very, very hard to kind of bring agencies on board around this concept, around this vision. But I think what you both said was a hundred percent, where once you start building momentum with a number of "champion agencies" if I can put it that way, those who actually believe and understand what you're going through and what you're trying to achieve and you start putting a product out there which resonates and works for the business customer audience, it's often then easier to build on that like a snowball. It gets bigger and bigger as more people kind of go, "Yeah, I know what it means now. I can see how my business or entrepreneur services relate to that audience and how I can bring it all together." It sounds like it is a little bit but I'm interested to see if there's been any differences at all along the way. Because there is I notice between the the Dutch version and the English version, there's probably a few more agencies currently participating in that Dutch version rather than the English version of the site. And I'm not sure if that's because of the nature of the audience is different. So the... tell me a little bit more about that. Wouter: Well, we started off the English, the Dutch project with a set of "founding fathers" as I call them, committed to the project and some decisions were made on their contribution to the project which meant delivering people to a common newsroom or editorial board where the content was managed and created. It's, the way you put it, it makes it sound like yeah, let's do this snowball. Let's grow from the winning examples but I have to be honest, we face a reality where different organizations still have different directives. They are positioned under different departments within the government, different ministries, different bosses. We as executive makers, developers, communications people, account managers, our board is very efficient I might say. Our team works very well, but we are also somewhere low in the hierarchy, so we are very facilitative. We work, so I would hope our, our role would grow to be that snowball experience where we would use these examples that work and there are plenty of those, don't get me wrong, but we will continue to fight against some forces from our perspective. Let's say yes, but some things are more important than this, some things are more important than that, some things are more hot on the political agenda and we just have to work around that first as an organization before we deal with you guys again for your great snowball projects. That's how it's been going and we've been managing to do that and we've grown the portal, It's not become this one-stop shop, where there are plenty of shops. So it's actually, the Dutch portal has grown from being a one place where you would go for the information to also where we are providing this information to a growing number of stakeholders. Our original partners, their websites, where we would plug in the information through an API, towards specific business sectors, regional governments where we bring the information to where the entrepreneur actually is. So this was a change in our approach to bring the information to the user. Though for English we do have that assignment, to grow and expand as Laurens can tell you about. Laurens: From the, there is a steering group I want to add that is, like it's not only bottom up. So there is a steering group with all the agencies involved and in that steering group, there are decisions made about the strategy and the commitment also from the different stakeholders and partners and agencies. So yeah, there is some, there is a formal structure as well. It's not only the agile approach and the snowball. Gavin: OK, that makes a lot of sense. I guess the challenge, and again not being able to speak Dutch it's a little bit hard to see and understand what's going in the Dutch version of the site. But has the approach to date been purely information based or have you got more into that transactional element as well for service delivery for business? Wouter: Well our our proposition is the information part. That's that's our assignment. We work closely together with those departments that are developing that aspect but that is as you can understand a complex one because many of these are spread all over the government, different government levels, different organisations. We do connect to these transactional elements and try to optimize, for example the amount of steps you have to take to get to where you need to be as an entrepreneur so we provide a lot of entrances or exits or whatever you would like to call them to get within a few steps to where you need to be. The management of the actual transaction is not what we do. We don't have the one storage of them all and the one government stack of transactions in one place. But with the European directive on the single digital gateway coming along, all the Member States will have to get that connected together and so we will be focusing on getting that to work even better than it does now. We do connect it. We have an index of the regional governments transactions connected to our information base where you can see, okay, my my city is this one. I'm based here. What do I have to do to for example, provide my cafe with a terrace permit? So have people sit outside when the weather is nice here in the Netherlands. Gavin: That's got to be a few times a year doesn't it? Wouter: Yeah, plenty of time to prepare for that in winter, for when the months of May and June arrives and sit outside for a few days this year. Now summers getting better, but the city's approach to handling these permits, they change so we try to bring the entrepreneur to that location quickly they put in where are they based, what do they need to take care of? But we still depend a lot on the information offered to us by these local governments. And mind you there is 385 of them. So connecting, this is a challenge. Gavin: That's a lot of governments for a very small physical geographic footprint! Gavin: I'm not saying its not, but I think yeah, I think you're a 100% correct. And I was going to ask a little bit of that what the experience is from a customer perspective but also and what you've been doing with building relationships beyond, to say the national government layer in the Netherlands with other partners in other levels or jurisdictions within the Netherlands? Wouter: Well, this is a bit different from the Dutch and the English website. Laurens is growing very much looking for all kinds of initiatives related to those businesses that want to actually base themselves in the Netherlands, start up in the Netherlands. There are many of collectives many new startup expert organizations, it's a bit of a different audience than the Dutch audience. But yeah, we do connect those two where possible. a better taxonomy, semantic databases, putting the different information together and we do have a lot of experience in connecting different, ingesting different data streams from those that just deliver us information as is, which we combine in packages. Another part we create ourselves with the common editorial newsroom. So it's a mixture of a lot of information that we have on the crossroads, which we would call the content hub that we are, and yeah, we're looking at improving that. We've seen for example in our European contacts lots of inspirational examples. In Finland, for example, I would say I talk to our colleagues in Finland they have built great structures in how to connect information and have their programmers build databases - smart databases - some AI learning capacities things like this, is what we are working on and I think in the next few years is definitely the type of tools we will be using to combine even more information and get better results on different platforms out to the entrepreneur. Gavin: Great. There's a couple of things there you've actually touched on there Wouter which I'd like to delve in a little bit more. One probably relates more to you and the other one is probably a little bit more to Laurens. So I'll ask both questions now whilst they're in my mind, and I don't forget. The first one was around that you talked about Finland and yourselves and that concept within the EU of the single digital gateway. Interested there about where you see yourselves compared to other member states and where other member states can potentially learn from yourselves or other governments within the EU? That's probably a question for you Wouter. And whilst I also don't forget, more probably for Laurens' point of view is, you know, when it comes to the different audiences that exists between the Dutch version and the English version, how does it actually drive the user experience and what you present to the customer? And how are things a little bit different in that proposition between the two? So happy for you guys to work out who answers which question first. Wouter: Beginning with your first question, and give Laurens some time to figure out the answer for the second. No, in the European context which Laurens and I pretty much do together, is, I can see there's a very open attitude, a very positive vibe within our European partners where there's not so much competition - you would think, "Yeah, the European directive, every country would want its own business to grow. Would there be any tension?" That was one of the questions I had first encountering these groups, but I think that's not something to be afraid of every country has its own geographical position, its own type of government, its own a target audience. I don't think there is a lot of direct competition going on there. As well as there are chances now for cooperating and seeing some of the challenges we face together at this time. There is a lot of exchange of information. How did you solve this? How did you solve that? And like I said the country specifics are very diverse within 27 different states you can imagine. Well we have 385 local governments, but this is different for every one of those 27 for me to study what they all are about is something complex to begin with so, to scale that down to smaller examples, how do you work with navigation? How do you work with gathering user feedback? How do you work with your systematics behind the the code base of the project, the product that you are developing? How do you tackle these things all these little elements? You find each other on specific levels and one is further in this field. The other is further in that field. And the open context of this European cooperation really allows a chance very low level, low threshold to say, "Oh great, we can perhaps work together on this field without competing with each other so much. So this I found this very positive, very inspiring. I've seen locally in more difficult conversations about working together within the Netherlands. Gavin: Strangely enough I'm not surprised. From my experience within the EU and the times that I've been to Europe and being the UK and so forth, I think you're 100% correct. I mean amongst the member states, it actually seems to be a lot more wanting to work together and learn from each other and it's more strangely enough that sub regional level, but things get a little bit more political. So anyway, some great insights there. Laurens, how about yourself for that other question I had about the differences between the English and the Dutch site and the reasons for that, and you know, how that derives I guess from the different, the different audience between the two? Laurens: Yeah, of course. There is a difference in the target group. So I would say that some of the content we made for the Dutch website is also interesting for the English website. We try to do it as efficient as possible. So we have actually native English editors to translate some of the content to the Dutch website, but I would say we have a feedback tool and we have a user centric approach for both websites and that makes it possible to get an insight in the need of the entrepreneur, so as well the native entrepreneur and for the foreign entrepreneur, and for example also we make content together with entrepreneurs such as the webinar we made I think a few months ago and also have like for an entrepreneur in the studio and in order that foreign entrepreneurs can identify them with the answer we give in that time of type of content. So we also do research about specific wishes of of the target group. Since we are based in the Rotterdam Chamber of Commerce, we can actually go to the floor where for people are subscribing themselves and we can ask them if its a sign when an international foreign entrepreneur. So we actually have some some field research and ask them questions. What questions do you have? And what can invite you to answer on the Business.gov.nl? So there are ways to get insight into what are the different needs of the target groups. So, and there are some difference of course in the approach and also the Dutch website we have a full partner editorial board. For the English website we have a small version of that because we don't need to do, we can make use of some of the aspects of the Dutch website and also regarding the code base of the website we can reuse that sometimes. So yeah, I would say that's the biggest difference. But also the ambition of the website. It's a little bit different because we're still young. We want to scale up in the next years. Gavin: It's interesting you talked about not only the differences but also the similarities that exist between the two which is, you know, really encouraging and one of the things you talked around there, was around the, say the content boards and so forth and I think Wouter also talked a little bit some other aspects of governance at a more senior level. Does that governance around how things work transcend? Does it cut across both of the sites so that they've seen is more an overall program of work rather than separate streams? Or how does that all come together? Wouter: The projects exist within the same government directive that gives us, assignments and the funding that goes with it. This includes both the portals we can separate the PSC Dutch and the PSC English with slightly different propositions, but it's part of the same law that allows us to do this, to put it like that. So it transcends like that. It's logical for us to be working on those two things at the same time which have enough similarities to work efficiently in improving. But when it comes to things like stakeholder management, the ambition in growing on English versus mostly managing and maintaining for the Netherlands or at least that's where the time goes because we are somewhat older and the positioning is different. We do grow still but it's not a start-up phase. English is much more a start-up mentality, new connections, new discoveries and we're a little bit more senior on the Dutch PSC. But it helps us, and it keeps us young to have our English language sister very close to us. It brings some dynamics also into the team. The same development team sees new challenges and some of the things we develop for English will provide us with information that is very useful for our more classic Dutch website and we, we surely hope to bring in that energy to work for both our portals. Wouther: Why English and why not another language? Gavin: Yeah like instead of German or why do it at all? Wouter: I think mostly a pragmatic approach as English within the European Union is an often used language. Gavin: Which is ironic if they leave. Wouter: Yes, well we still have the Irish so, you know, officially it's still a language within the EU but I think the Dutch are comfortable with the English language. We can understand the product we're working on which would become slightly more complicated as we grow towards German and French and even beyond. Nevertheless, I think I wouldn't exclude expanding to other languages as there are many Dutch initiatives in focusing to our closest, or more close neighbors, working with Germany, this, there English is perhaps not as common as it is in the Netherlands, so surely the language we use should also be taken seriously, is it the final answer English? I don't know. Laurens: And also the SDG would say, would prescribe that, at least the national language and then the second leg which would be the language that is most relevant for all the countries around. So if you focus only on the Germans and then the French would say, "Yes, what about us?" So I would say that the English language is for now, it's the best second thing we could do, so but never, yeah, we cannot tell what the future will bring for us of course. Gavin: Do you find that with the English version of the site, when it comes to that audience are they English speakers who happen to be within the Netherlands or are they English speakers who were outside of the Netherlands or is it a mix of both?And is so what's the proportion? Laurens: Yeah from the analytics point of view we see that 40% - a little bit less - roughly 40% of the visitors have an IP address on Dutch ground, so 60% is outside the Netherlands as for their IP address. So, and we focus mainly on the foreign entrepreneurs who want to start a business in the Netherlands or want to do business with the Netherlands. So they have a specific branch in another, outside the Netherlands and they want to trade or something but, yeah, and also the English-speaking entrepreneurs, they can of course get information, but it's not the main target group for the English website. Wouter: good to know in the difference between the propositions is that the focus on the English website is also promoting of course the Netherlands as a favorable place to start your business as an outsider and the site is not so much a translation of the Dutch PSC. Because this would be, that would mean it's an accessibility issue actually of the Dutch platform. To have somebody who doesn't speak the Dutch language and inform him or her, it serves that purpose well right now. It could be within that 40% of businesses that they are Dutch entrepreneurs that are from a different origin but already a long time entrepreneurs in the Netherlands that just have more problems with the Dutch language and prefer to be served in English. But mostly that's a bit of the difference. Doing business with the Netherlands, doing business in the Netherlands, coming through the Netherlands. Those are the topics which have the focus on Business.gov.nl and some of the information is, serves the Dutch existing audience as well, but it's not as complete as the Dutch offering on the website. There's fewer articles, the site is younger. It could grow either direction or both. Gavin: A couple of things. First one being I guess is by providing that English language experience within a country that's obviously, you know, Dutch is the normal, is the primary language and broadly across the European Union with the exception of course of the UK and Ireland, all the other languages within the EU are very different. They're not English. So I'm interested there in the point of view of how you've actually given yourselves a competitive advantage by providing this English language experience so that those companies that are obviously out there and they're looking for opportunities. They're looking for where they should base themselves within say the EU, and the fact that you are more naturally found because you've got content there.You're likely to be found in Google and other locations like that. Do you kind of, do you actually at the moment do any performance metrics? And is there any measures that you currently track around, you know, around the investment attractiveness of the Netherlands as a result of the site or is that, somewhere else looked after that or how does that all work? Wouter: I think would be much too arrogant to say we play a big role in this investment climate and there are different initiatives and there are plenty of initiatives also based in English for start-up entrepreneurs in the Netherlands. I think it's well known the Dutch are among the best non-native English speakers existing, probably along with a few Scandinavian countries. We perform pretty well in English, relatively well. If it's not our mother tongue, this probably is not due to us that companies know this. But perhaps, yes, it adds maybe that we are growing our information base online. That's definitely what we hope to do, maybe a very, very small percentage is convinced by what, but I think we shouldn't take that part too serious. They should probably already know about the Netherlands. So probably they already have met Dutch people abroad, have investigated multiple levels before they even arrive at Business.gov.nl. Laurens: And we see in the feedback tool, we see that people are, like being helped to make the next step in their business and at the moment like roughly 2,000 visitors a day are yeah, finding some information to make the next step. So I think that would say that is the added value of Business.gov to the maybe the Dutch economy, right now. But of course, yeah, we want to, we try to improve that and but we don't, don't have a KPI set on that right now. I just want to make a complete set of information and yeah. Gavin: It's very much like German where you've got these massive long words, you know, Ondernemersplein. Wouter: Or something. Yes, so no it's, it works better for all parties involved at times to speak English and I hope that's also something indeed welcoming for entrepreneurs coming to the Netherlands. They won't ever, they won't have a problem in their daily life they can even get their stuff in the supermarket and get by with speaking English. So yeah, that gives a competitive edge maybe yes, but I'm sure that will slowly grow on the European scale as well. Whenever we go to Brussels we speak English with other team members from different states. It's the language by choice because it connects to, it connects to the most. Maybe the French-speaking would like to see it otherwise at times but I could try my very best but it's never going to be as good as speaking English. Laurens: One thing to add also especially in the startup, like the scalable startups, the highly innovative startups, also English is very, very widely used in the Netherlands. And yeah, some countries are less English oriented, but we are. Gavin: I've actually been in the Netherlands three times in my life and spoke English the whole time and everyone understood me so that was fine. Laurens, one thing you actually mentioned was about startups. And I think it was Wouter who mentioned earlier on around the different, I'll use the word "culture" for lack of a better word at the moment, around how the maturity exists within Dutch project versus the English project and how the English project feels more like a startup. Do you have teams who kind of cut across both? It sound a little bit like you've got some people that do and some people that don't, and how does that work from a, you know, from that point of view of something that's a more mature model versus having something that's more a start-up model from a service delivery perspective in government. Laurens: Yeah, we have an agile approach. So in our team we have the agile scrum approach and as a result we can have short cyclic improvements, development. And for Business.gov, that's very nice because being so young we can just check what are the different improvements we want to make and also realize them quite quickly. So that's really, but actually we started with agile working earlier, I think maybe Wouter knows maybe for two or three years or even more, also for the Dutch website. But I think that's really important to have like every, every month make improvements on the content side of you, on the development side of you, but also for the insight and analytics. But maybe Wouter can explain a bit more about that. Wouter: The English website started as a, in a project phase as most things do. A project is defined and a budget is given for a specific time of running it. Working in the agile scrum method allowed us to use the development base that we have for the Dutch portal to give a percentage to the English starting up website because starting a separate full-fledged team for English would have been more costly. And after the initial project phase was over it was quite easy for us to embed the activities for English when it comes to the product development itself. The mostly technical product development that is into the same group of development which provides a fully functional portal when it comes to the other business aspects, where you would look at the stakeholder management, where you would look at running the business around content creation, the editorial boards that we have, these are pretty much separate activities obviously because we use native speakers for the English content and there is, we sit closely together in each other's proximity so that also allows working with each other's content types, asking each other for, "What would be a good plan? What would be good to do?" But there is still part of it is a separate business which which Laurens focuses on for a hundred percent. And it's a smaller group, the Netherlands has this big amount of stakeholders which have representatives within the team and this is you know, still young for English. So we plan to expand this but we might even improve on what model we use to do that, and who is in charge of what element. We have some lessons learned, of course in the history of our Dutch project and in becoming mature perhaps we can make English PSC mature quicker or mature with a few less challenges that we had in the years for the Dutch portal. Gavin: Okay, I guess in wrapping things up, where do you see things going for both of the Dutch and the English instance over the next couple of years? Lauren: Yeah, I think maybe to add also, that's having the agile approach we have quite relatively high speed of development for government standards at least. So, and also, like having the Dutch website as an example, for the English website it's very, very good to have like the maintenance and also the structural, yeah approach, to have it like embedded into a different or into a specific approach, yeah. I think for the evolution of Ondernemersplein and also Business.gov, yeah, I would say we have some things coming up at (indecipherable) of course or development we are are trying to prepare for that. Gavin: Sorry Laurens, could you repeat that? What was the name of that thing? There was just a little bit of, internet thing going on there. What was it called? Laurens: The (indecipherable) law of course, makes it, we want to prepare for that and regarding the Dutch website, we are preparing some taxonomy improvements maybe Wouter can explain a bit about about that and also the future. And also the English website we want to have more content partners and yeah, have more research (indecipherable), what are the exact wishes of the entrepreneurs, different types of content, maybe new webinars as well. Wouter: Multi-platform, I think what counts is that we will continuously improve and experiment with our navigation structures, our content types. What do we have? What works? What is new? A few years ago we had the webinars. Well now everybody has webinars. So we're trying to see what else is there? How can we optimize that? How can we engage the customers in better ways? We'll be diving into more surveys, looking at what are the needs and one of the important things currently which has our focus in the Dutch portal is getting to know the audience even better. And how do we do? That is by, as I mentioned earlier, we are also now connected beyond our own single point of contact in bringing our information - for example, regional locations, geographical locations in the Netherlands. So we're curious in getting input from what happens there? What is necessary for entrepreneurs in specific regions of the Netherlands as well as in specific business sectors? So we we connect to those local governments, we connect to these business sector organisations to see how can we get to know these entrepreneurs better in providing them the experience they need from the government by identifying their needs in those specific sectors, which is I think going to be our role in the near future. To be not only a distribution hub, but also becoming a feedback hub from gathering these data, gathering these wishes from entrepreneurs in places where the government has been fragmented still on a level of different layers. And we can use that feedback. What do they need in this sector? What do they need in this region? And bring that back to the highest level of government saying you are missing something, you are perhaps wanting to focus on something that we signal only in the south of the Netherlands or only in a specific city, and I see a lot of development there but this is also a new trajectory for us and provides many challenges. How specific do we want to be? How big is the audience in those specific elements? Those are the things we are looking at right now. Gavin: Excellent. Gentlemen, that's been really, really interesting. I've learnt a lot. I hope our listeners have too. Thank you very much for sharing with me and my audience today around the Dutch experience with delivering both Business.gov.nl and Ondernemersplein. Wouter: Thanks a lot for having us. 0 Comments on "Podcast episode 8: Interview with Laurens den Ouden & Wouter Nieuwenhuis on the Netherland’s business portals"